Happy New Year! And why not a new look with it? It will continue to be tweaked over the next week as I improve formatting, colors, etc. Anyway, we had a quiet New Year’s Eve starting with stepping out for sushi and coming home to watch movies and it was nice after all the Christmas excitement. 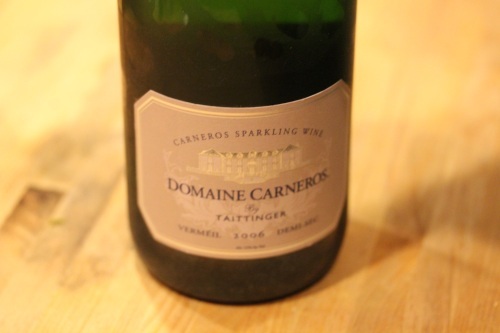 A little bubbly was toasted at midnight that we picked up while on our Napa trip. It wasn’t a cheap bottle, but oh so worth it having a slightly sweet taste and smell, perfect amount of bubbles and no bitter after taste. Staying in last night was also nice because our weather has been all over the place pouring rain currently. Yesterday we had a beautifully crisp and clear morning with everything covered in frost. 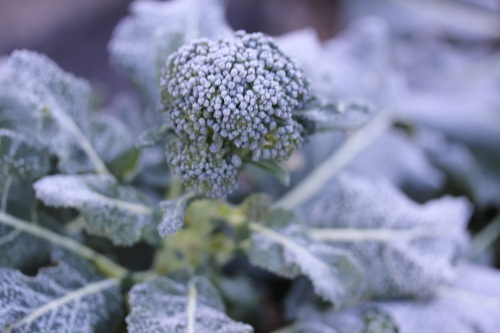 I didn’t care that it was only 30 degrees when I was out snapping these pics in our garden, broccoli and kale are gorgeous covered in frost. Incidentally, these were summer crops that died off in the fall and bounced back for the winter. I had no clue they’re winter crops too, but I’m loving having fresh broccoli and kale ready to go. And I’ve been enjoying other eats over the relaxing weekend while having more time in the kitchen to find good get-back-on-track recipes. Starting with Gena’s Red Pepper and Hemp Soup. 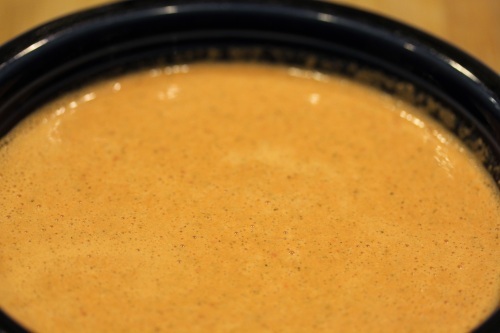 It’s one of my favorite raw soups because it’s packed with flavor, the curry and turmeric give it a nice punch without going overboard and blend nicely with the tang of lemon juice, kind of a nacho-cheezy soup. I also like that it’s a highly nutritional soup having plenty of protein from the hemp seeds, but not being overly filling or bloating. It makes a good, light meal before a workout and can be heated up if you’re not in the mood for a cold soup either by running it longer in a Vita-Mix blender or pouring it into a saucepan. I remember when I first tried it over a year ago, I had no clue what hemp seeds were and tracking them down in the Whole Foods bulk foods section was an adventure. Now I go through so many hemp seeds that I order 5 lb. bags from Amazon every two months! I also discovered a wonderful ice cream recipe thanks to Mama Pea. One flavor that I do miss slightly since going vegan is eggnog and I haven’t had a chance to track down a good vegan alternative yet for the holiday season. When I saw her recipe for Eggnog Soft Serve, I was thrilled that I actually had all ingredients on hand! 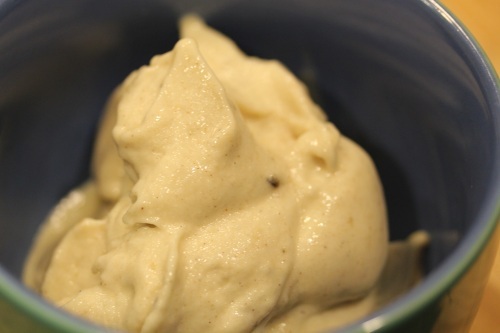 Frozen banana slices are a constant in my freezer for ice “cream” attacks and smoothies and her recipe looked deliciously simple – and it was! It looks a lot like eggnog too, right? Trust me it tasted a lot like it with just the right amount of nutmeg and pumpkin pie seasoning. And the texture was wonderfully rich and creamy. I like that it uses stevia for sweetness making it a great treat to enjoy while trying to get back on track for the new year. I’m hoping my sister sees this and ditches the non-vegan eggnog in her fridge. Like eggnog? Try this recipe! 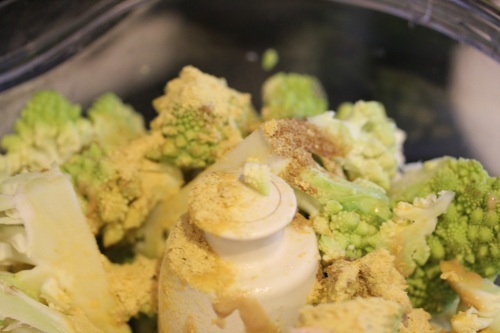 Finally, I also made a huge batch of Gena’s Broccoli Hummus using romanesco broccoli and it’s a simple throw together if you don’t mind breaking out your food processor. I like that this recipe uses zucchini and broccoli as the base instead of chickpeas making it a lighter, lower calorie and veggie packed version of hummus. Yet it still has the familiar tang and flavors of traditional hummus with a light, whipped texture for easier dipping and scooping. 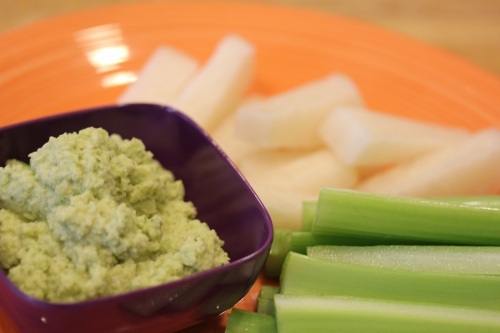 Having a big batch ready to go in the fridge with veggie sticks is perfect for snack attacks. 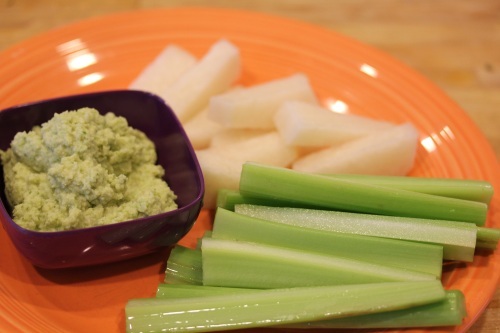 I paired it with celery and jicama sticks, but it would be great with just about any veggie – carrots, cucumbers, red pepper slices, etc. Since it looks like it’ll be pouring rain all day here, I’ll be spending most of it indoor tackling the ugly project of tearing down our Christmas tree, vacuuming up a million pine needles afterward and packing up decorations. I wish I could say I was looking forward to it, but it has to be done! Have a wonderful New Year’s Day! Christine this new layout ROCKS!!!!!!! Omg I love love love it! 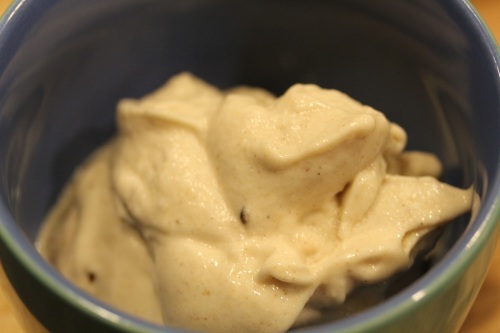 Mama Pea’s eggnog ice cream, saw it this week and wanna make it..thank you for sharing your thoughts on it! Now i want it even more. 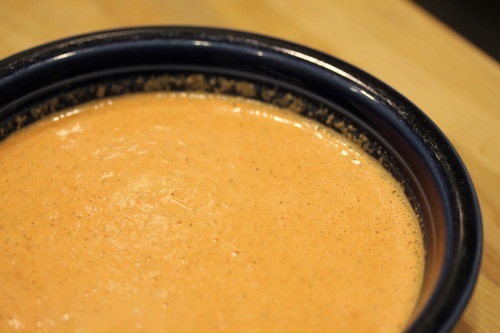 Gena’s soup…yes, have seen you and her make it and I make a hemp seed dip, i called it cheezy spicy doritos dip b.c it tastes kind of like doritos, but really just red peppers, nooch, hemp seeds, you cant go wrong! 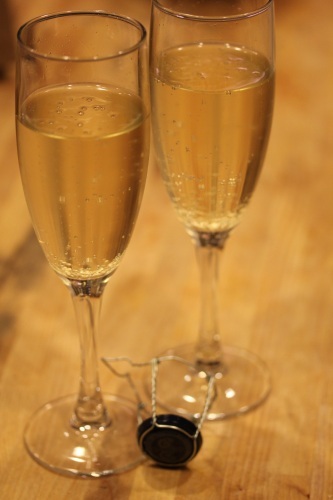 And “It wasn’t a cheap bottle, but oh so worth it having a slightly sweet taste and smell, perfect amount of bubbles and no bitter after taste.”—–SO TRUE! Thank you! :-) The ice cream is totally worth it, I was surprised at how much it tasted like eggnog and I bet Skylar would love it! Loved the new layout, girl! And that Eggnog soft-serve, too. Haha. 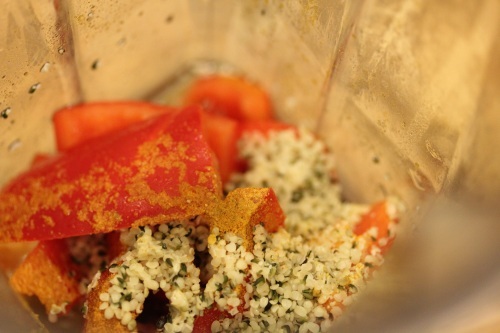 Wow—the red pepper and hemp soup looks great—I had seen it on Gena’s site and then forgot about it. It’s on my list for sure now. I’m also totally on board for the eggnog ice cream. It’s been awhile since I’ve made the soup, but it was just as good as I remember. 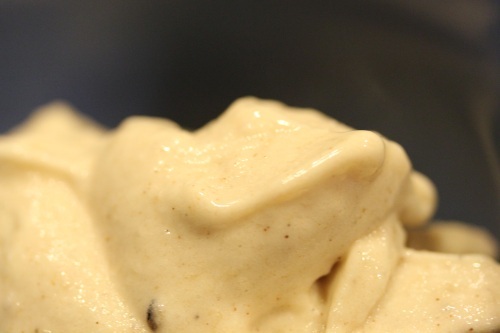 And the eggnog soft serve is a great treat that’s super easy. That hummus looks great!!! And eggnog soft serve = YUM! Looooove the red pepper hemp soup-I haven’t made it in so long-thanks for the reminder!!!! 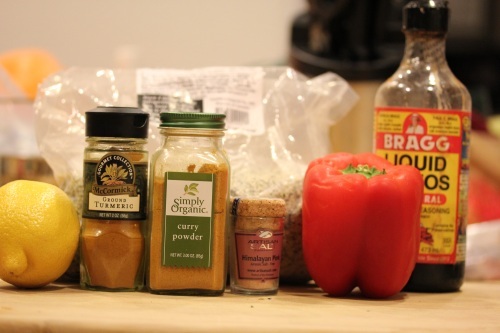 Gena’s red pepper recipe is DELISH! 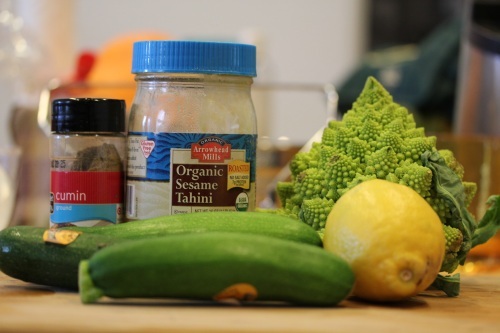 I love it as a sauce for spaghetti squash or zucchini noodles. I think you can indulge in good quality alcohol because your grocery bill is probably lower with a vegan kitchen, haha. Ahh, good champagne. It totally spoils you against the cheap stuff, doesn’t it? I wish I could find cheaper red peppers. I don’t get to eat them very often because they’re always so darn expensive! Love Love Love the new blog layout Christine! Im looking to do a new one too and also Im looking for a comment setting like yours, where I can reply back to the comment, any tips?! Thank you so much for the peanut flour recipe! U rock! You would LOVE Lululemon! Seriously you need to go there, be glad though you have not, it is expensive and bad for the wallet! lol! Awesome that the crops bounced back for the winter! 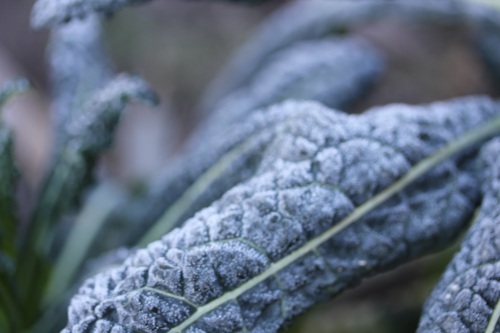 It’s great to have some fresh greens year round ; they are also very pretty in their frosty outdoors state meanwhile!